1. Roughly crush the cumin seeds with the chilli between two spoons or in a pestle and mortar then add them to the olive oil, garlic and some seasoning. Use the mixture to coat the diced lamb. Cover and leave to marinate in the fridge for at least 15 minutes but up to an hour if possible. 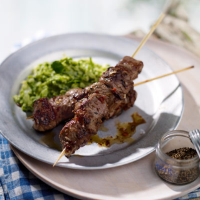 Soak 8 wooden skewers in cold water while the lamb is marinating. 2. Cook the peas in a pan of boiling water until just tender - 3-4 minutes for fresh or 1-2 minutes for frozen. Meanwhile, melt the butter in a frying pan and sauté the leeks for 4-5 minutes until soft. Drain the peas and mash with the leeks, mint, yogurt and some seasoning. Cover and keep warm. 3. Preheat the grill to high or barbecue. Thread the marinated lamb onto the wooden skewers. Grill or barbecue the lamb for 6-8 minutes, turning regularly until well browned and the juices run clear. Serve with the pea and leek mash. Diced lamb shoulder or chicken breast works just as well as diced leg in this recipe. Try a serious style of rosé here - one that’s full of flavour, but is still deliciously elegant and refreshing: Champteloup 2009 Rosé d'Anjou, Loire, France.